On Saturday the 27th of January 2018, the Kursalon Vienna will once again host the annual Johann Strauss Ball. Always a highlight of the Vienna Ball Season, this year’s event promises to be even more special: the Kursalon Vienna will be celebrating its sesquicentennial. To commemorate this anniversary, the theme for the evening will be “150 years of Kursalon Vienna”, offering music lovers, and all who admire Viennese culture, a night of fine food, dancing, glorious melodies and a whole lot more. 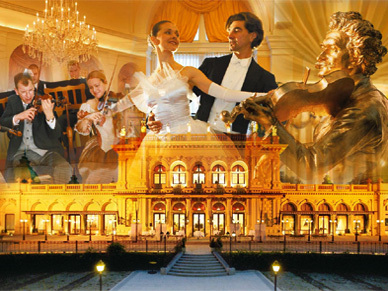 A cornerstone of the city's cultural life, the historic Kursalon Vienna is indelibly linked to the name of the world-famous “Waltz King”, Johann Strauss, the Younger, who performed there regularly in the nineteenth century. This year the Kursalon Vienna opens its doors at 6:00 p.m to admit guests to its exquisite surroundings. A delicious three-course dinner is served between 7:00 p.m. and 8:30 p.m.
Dinner is followed at 9:00 p.m. by the Opening Ceremony that marks the official start of the Johann Strauss Ball. The professional dancers of the Rueff Dance School take to the floor in a spectacle that recreates the elegance and grace of old Vienna. Musical accompaniment for the dancing is provided by the Salonorchester Alt Wien, an ensemble whose musicians are considered to be amongst the very best interpreters of the Viennese musical tradition. The Waltz Workshop, an ever-popular feature of the Johann Strauss Ball, gives those attending the opportunity to learn a little more about the secrets of the waltz, along with other dances, from professional experts in the Kursalon’s inspirational setting. Throughout the ball, guests will also enjoy several special anniversary tributes and surprises. One already scheduled is an appearance by the prestigious Vienna Boys' Choir – a fitting acknowledgement of the Kursalon's statement as one of Vienna's premier music venues, delivered by world-class performers. One of the evening's most eagerly anticipated moments is the Midnight Quadrille, a traditional Viennese set piece which is fun to watch and even more fun to take part in. The important elements are a crowded dance floor, a lively pace, slightly chaotic instructions and lots of humour. Guests are encouraged to reserve a little energy for later on in the evening too. At this point, the live music moves into the twentieth and twenty-first centuries to keep everyone in the party mood, with hits from the 1980s to the present day. Make sure that the Johann Strauss Ball on the 27th of January 2018 is in your diary. It promises to be an evening of entertainment you will never forget.